FORMING the arm (bahu) of the prestigious Panch Kedar tradition, the Tungnath temple is situated at a height of 3680 metres above mean sea level in the Garhwal Himalayas. Together with Kedarnath, which forms the hump of the twelve most revered jyotirlings in the country; Rudranath, which represents Shiva's face; Madmaheshwar, which conforms to his naval and Kalpeshwar which represents the Lord's hair, Tungnath, which forms the arms of the Lord, is held in high esteem by those in the quest of spirituality. It lies about 30 km from Ukhimath, roughly between Kedarnath and Badrinath, the place from where most of the learned pandas of Kedarnath hail. 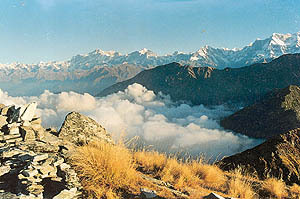 It is a trek of about 3.5 km from Chopta. 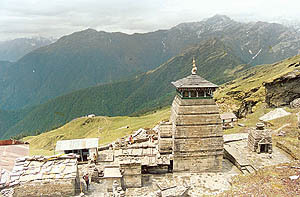 Tungnath offers a panoramic view of the Panchchuli, Nanda Devi, Dunagiri, Nilkanth, Kedarnath and Bandarpoonch ranges. Set in the midst of temperate forests in the Chamoli district of Garhwal, the origin of the Tungnath temple is shrouded in myths and legends. One of the most credible myths associated with the Tungnath temple is that it was built by the Pandavas on seeing the wrath of Shiva at the carnage they had wrought at the battle at Kurukshetra. It is said the Pandavas dedicated this temple to the enraged God of destruction, as much as an act of appeasement as also for their own salvation. Chopta, at over 8000 ft above sea level, is the base camp for a trek up to Tungnath. It rains in such abundance here that travellers have often nicknamed it the Cherrapunji of Uttarakhand. Chopta is easily approached via a motorable road from Rishikesh via Rudraprayag and Chamoli. One can also access it from Ukhimath on the Badri-Kedar route. There is a GMVN rest house here for the convenience of trekkers and pilgrims. Though one must bear in mind that accommodation is limited and hence it is important to book well in advance. The trek from Chopta to Tungnath is hardly 35 km, yet one ascends a compelling 3000 ft. in that distance, which calls for a fairly steep climb. Wild rhododendrons, chirping birds and nature keeps you company all the way. On reaching Tungnath, at roughly 12000 ft. above sea level, the tree-line gives way to alpine meadows — Bugyals — strewn with tiny wildflowers. Acres and acres of heaven engulf you in their fold, even as cascading waters surround you and birds in flight keep their vigil. Apart from the religious import of the place, one cannot deny the reprieve it offers to stressed-out souls. This probably explains why, despite there being no facilities whatsoever at Tungnath, tens of thousands of pilgrims visit this divinity year after year. Besides which the solid granite structure of the temple itself instils one with piety and reverence. A little away from the Tungnath temple is the shrine to the moon mountain, Chandrashila. The trek to Chandrashila offers a panoramic view of the Himalayas in all their splendour on one side and the valleys of Garhwal on the other. Truly, the gods must co-exist in these mountains, as just visiting this place completely redefines one’s own understanding of life even as it alters one’s view of existence and the relationship between one’s body and soul. Although every season offers a spectacular and myriad view of the majestic Himalayas, May and June are particularly ideal months to trek to this place. Though the flowers are in full bloom only after the rains, i.e., in August/September thus making for a picturesque trip. From a religious point of view, the monsoon is the ideal time to offer obeisance to Lord Shiva. During the winter months, between November and March, the weather is so rough that even the locals migrate to the lower reaches of the Himalayas. How to get there: One can access Tungnath from Rishikesh via Rudraprayag and Chamoli, either by bus or taxi/car etc., on to Chopta, the base camp for actual trekking to Tungnath. Another approach can be via Ukhimath and Doggalbitta on the Badri-Kedar route. From Chopta a picturesque 3.5 km up 3000 ft, brings you to the portals of this ancient shrine. By train: Due to temporary suspension of flight connections to Jolly Grant Airport, Dehra Dun, one can opt for a mainline train to Hardwar, and cover the rest of the 22 km to Rishikesh by road. Alternately, a slow rail shuttle is also available from Hardwar to Rishikesh. By road: Regular deluxe and ordinary bus services are available to Rishikesh from most parts of U.P., Delhi and other towns in Garhwal. Both D.T.C. and U.P. state buses run air-conditioned coaches in the summer months. Local transport: Three-wheelers and the local Vikrams are available between Hardwar and Rishikesh, as also for commuting locally. The GMVN also arranges for the hiring out of coaches and cars etc. Tel: 011 332 6620, 332 2251, 371 1296. GMVN Ltd., 74/1 Rajpur Road, Dehra Dun, Uttaranchal.